The effect of the addition of yttrium (Y) and Al–5Ti–1B modifiers mixing melt (3M) on the microstructure and mechanical properties of hypereutectic Al–20Si alloy was studied in the present work. The as-cast specimens were examined by scanning electron microscope equipped with energy spectrometer, electron probe microanalysis and X-ray diffraction. The results demonstrated that the morphology of primary Si could be refined from coarse irregular star-like/plate-like structures into fine blocks with the addition of 0.6 wt% Y and 1.0 wt% Al–5Ti–1B at 650 °C. The average grain size of primary Si was reduced from 82 to 29 µm, and the aspect ratio was decreased from 1.81 to 1.47. Similarly, the eutectic Si structure was modified from coarse needlelike/flake-like structures into fine coral fibrous structures and partial granular structures, with the mean roundness of eutectic Si decreased from 7.8 to 2.32. In addition, the coarse α-Al dendrites were significantly refined into the uniform equiaxed dendrites. With the refinement and homogenization of Si phases, the optimal modified alloy obtained the optimal ultimate tensile strength (UTS) and elongation (EL). The UTS was enhanced from 94 to 154 MPa, and the EL was increased from initial 1.12 to 1.79%. Furthermore, the refinement and modification mechanism of the addition of yttrium and Al–5Ti–1B modifiers mixing melt on Al–20Si alloy were also discussed. Hypereutectic aluminum–silicon (Al–Si) alloys have been widely used in aerospace and automotive components, owing to their superior casting performance, low thermal expansion coefficient, high specific strength, high wear resistance and corrosion resistance.1, 2, 3, 4 However, the conventional solidification morphology of hypereutectic Al–Si alloys consists of the developed α-Al dendrites, the coarse plate-like/star-like primary Si and coarse needlelike eutectic Si, which leads to stress concentration at the tip of Si phases and weakens the tensile properties of Al–Si alloys.5,6 The morphology, size and distribution of Si phases significantly affect the mechanical properties of Al–Si alloys.7, 8, 9 Therefore, it is necessary to obtain fine and uniformly distributed Si phases to improve the mechanical properties of hypereutectic Al–Si alloys. Refinement and modification of the Si phase can be achieved by various processes, such as melt superheating treatment,10 introduction of an applied energy field (ultrasonic and electromagnetic),11,12 chemical modification13 and rapid solidification.14 Among them, the chemical modification has been applied to industrial production owing to its low cost and high efficiency. It has been reported in published lite,rature15, 16, 17 that the primary Si crystals can be effectively refined when red phosphorous, phosphate salt, Al–P or Cu–P master alloy were added into hypereutectic Al–Si alloys melt. The researchers thought that AlP particles can act as heterogeneous nuclei of primary Si crystals during solidification due to similar crystal structure and lattice parameters between AlP and Si. Moreover, Zuo et al.18 have reported that complex addition of P and Sr can simultaneously refine and modify primary and eutectic Si of hypereutectic Al–30Si alloy in relative low melting temperature at 770 °C. At the same time, numerous scholars have made a large number of efforts to refine α-Al dendrite and modify the Si phases in Al–Si alloys by introducing the different modifiers into the Al–Si alloys melt. 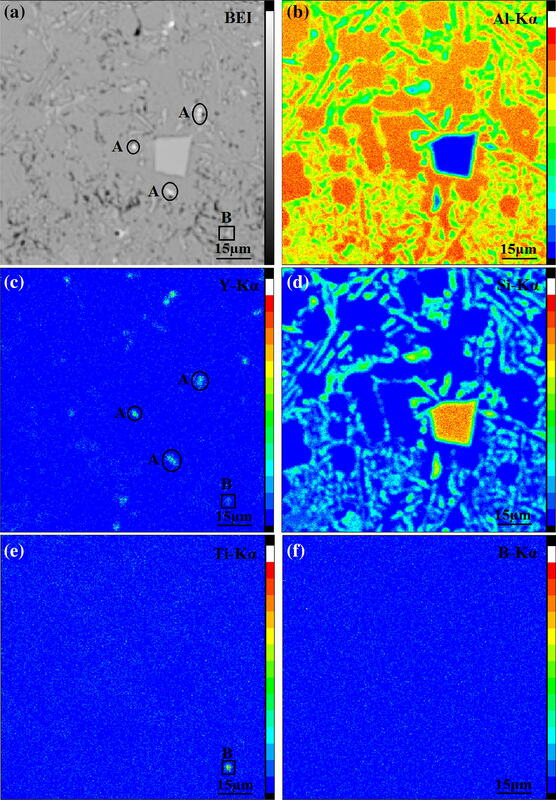 Yoo et al.19 investigated the effects of adding Al–5.0 wt%Ti–1.0 wt%B on the microstructure and mechanical properties of the as-extruded Al–Si–Fe–Cu–Zn–Mn-based alloy. The results showed that the ultimate tensile strength (UTS) of the alloy increased from 93.38 to 100.01 MPa due to the formation of TiAl3. On the contrary, Li et al.20 reported that the Al–3 wt%Ti–4wt% B had no significant modification effect on the eutectic Si in Al–7.13 wt%Si–4.03 wt%Cu alloy. This was because the Al–Ti–B grain refiner was confronted with some deficiencies, such as the dissolution of TiAl3 plates, the agglomeration and precipitation of the TiB2 particles and the poisoning phenomenon aroused by alloying element (Zr, V, Cr) in the Al alloy melt, which results in the reduction of refinement effect.21, 22, 23 Especially for Al–Si alloy with high silicon content, for instance hypereutectic Al–Si alloy, α-TiSi layer was formed by the Ti and Si elements covering on the surface of TiB2 particles, which decreased the concentration of TiAl3 and weakened the heterogeneous nuclear capability of TiB2.24, 25, 26 Therefore, more and more novel modifiers, such as Al–Ti–B–C and Al–Ti–B–RE master alloys, have been investigated to modify the microstructure and improve mechanical properties of Al–Si alloys. Zhang et al.27 prepared the Al–3Ti–1B–0.2C master alloy with uniform microstructure. It was found that the 0.2 wt% Al–3Ti–1B–0.2C master alloy effectively refined grain of A356 alloy. The average grain size of α-Al dendrites was reduced from about 1570 to 167 ± 8 μm, and the UTS, yield strength and elongation (EL)were also significantly improved. Xu et al.28 revealed the microstructure evolution and refinement mechanism of the Al–Ti–C–RE grain refiner. It was found that the TiAl3/Ti2Al20RE core–shell structure acted as the nucleation substrates of α-Al and refined the microstructure in pure Al. 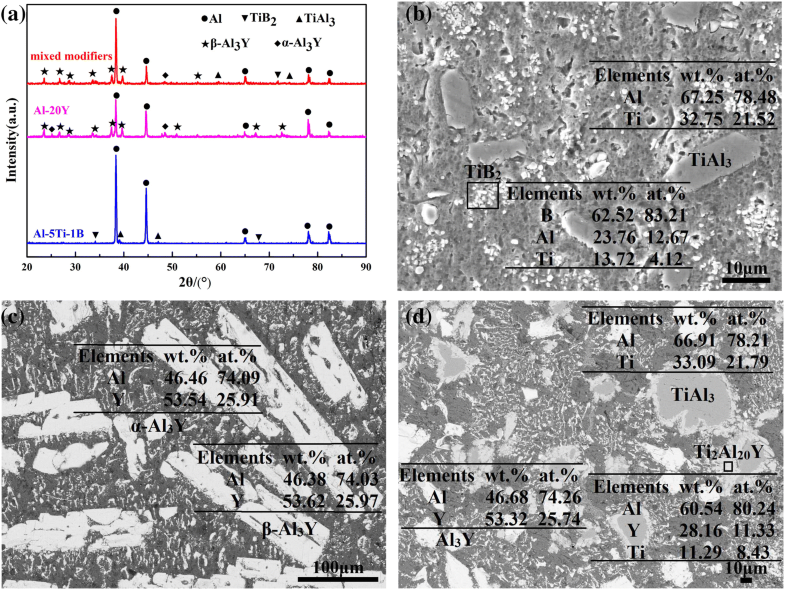 Sheng et al.29 showed that the addition of Al–5Ti–B and Y complex refined α-Al and modified eutectic Si in hypoeutectic Al–9Si–0.5Mg alloy. This indicates that the complex modifier can realize α-Al phase refinement to some degree, but it also leads to coarsening of eutectic Si in Al–9Si–0.5Mg alloy. In summary, it is of great value to further research the influence of Al–Ti–B–RE on microstructure and mechanical properties of hypereutectic Al–Si alloy. There have been no research reports demonstrating the effect of the addition of rare earth yttrium (Y) and Al–5Ti–B modifiers mixing melt (3M) on the microstructure and tensile properties of hypereutectic Al–Si alloy. In the present work, the effect of the addition of yttrium and Al–5Ti–B mixing melt on the microstructure and mechanical properties of hypereutectic Al–20 wt%Si alloy was investigated. Moreover, the refinement and modification mechanism of primary Si and eutectic Si were also discussed. 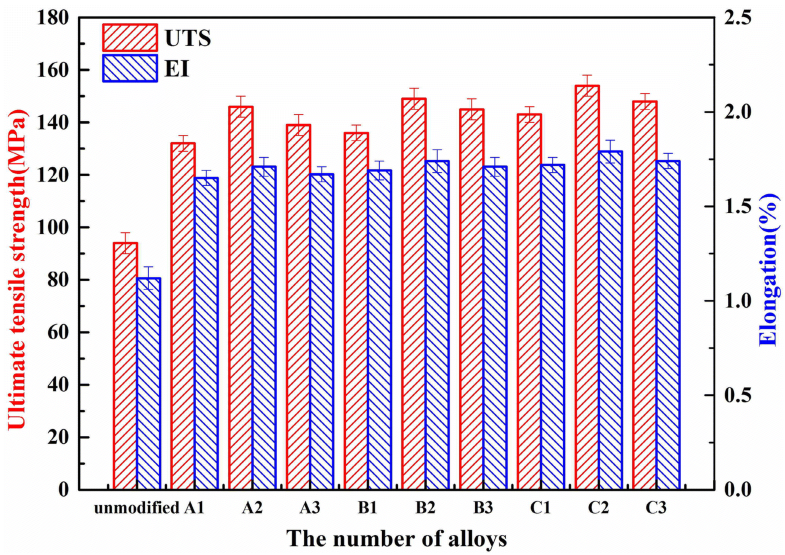 In this experiment, commercial Al–5Ti–1B and Al–20Y master alloys were melted by an appropriate rate and held at different temperatures to prepare the mixed modifier melts. The detailed procedures were as follows: First, the 1.0% addition of an Al–5Ti–1B master alloy was weighed, and the Al–20Y master alloy was also weighed based on the addition amounts (0.4, 0.6, 0.8%) of rare earth Y. Next, the Al–5Ti–1B and Al–20Y master alloys were melted at 850 °C in a clay–graphite crucible by silicon–carbon (Si–C) rod melting furnace. Then, the melt temperature was reduced to different levels (750, 700, 650 °C) and held for 10 min. At this point, the mixed modifiers melts with different temperatures were prepared. After that, the mixed modifiers melts naturally solidified, of which the phases composition and distribution were observed. The schematic diagram of the modification process and the steel mode are shown in Figure 1, and the detailed process parameters and corresponding sample numbers are shown in Table 1. The hypereutectic Al–20Si alloys (the specific chemical composition is shown in Table 2) ingot was melted at 780 °C in a clay–graphite crucible by Si–C rod melting furnace. The prepared mixed modifiers melts were poured into the Al–20Si melt and the continuously stirred to ensure the homogeneity of compositions. Then, the quantitative hexachloroethane (C2Cl6) was wrapped with aluminum foil and pressed into the melt to remove the gas and inclusions after the mixed melt was held for 5 min at 750 °C. 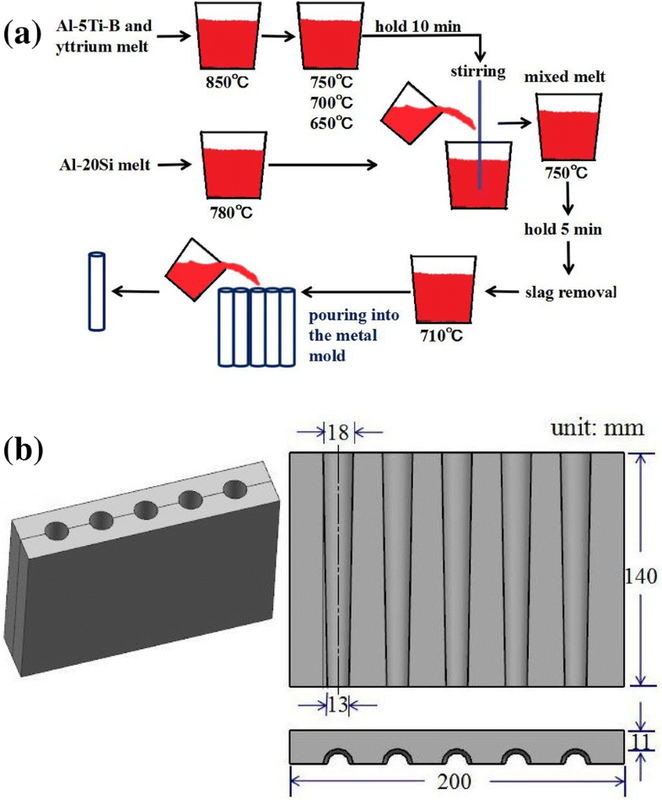 After the slag and dross of the melt were skimmed, the melt was poured into the preheated 200 °C permanent steel mold (18 mm in upper diameter, 13 mm in lower diameter and 140 mm in length) at 710 °C to obtain the 3M process-modified alloy samples. Schematic diagram of the modification process and steel mold: (a) modification process and (b) steel mold. Samples were taken from the same height of casting rod. Metallographic specimens were prepared according to the standard procedures and then etched with Keller reagent (95 ml H2O, 2.5 ml HNO3, 1.5 ml HCl, 1 ml HF) to examine the morphology of Si phases. Meanwhile, the samples were deeply etched with a solution (35 vol. HCl, 30 vol. H2O2) to obtain the three-dimensional morphology of primary Si and eutectic Si. The microstructure was characterized by JSM-6700F field emission scanning electron microscope (SEM) equipped with the energy-dispersive spectrometer (EDS). The average grain size, aspect ratio of primary Si and the average roundness of eutectic Si were measured by the Image-Pro Plus (IPP) software. The solidification structure of mixed modifiers was observed by the backscattered electron (BSE) image. Finally, the samples also were analyzed by X-ray diffraction (XRD) instrument (D/max-2400) and electron probe microanalysis (EPMA) in conjunction with wavelength-dispersive spectroscopic (WDS) to explore the existence and distributed state of modified elements. In order to evaluate the effect of the modification process on mechanical properties of hypereutectic Al–20Si alloy, conventional tensile experiments were carried out. The five tensile samples (the gauge is 40 mm and the diameter is 8 mm) were machined from previous cast round bars. Then, the tensile test was carried out at a speed of 2 mm/min on a universal material testing machine at room temperature to obtain the average values of UTS and elongation EL. Moreover, the fracture surfaces of hypereutectic Al–20Si alloy were represented by SEM images, based on which fracture model was estimated. 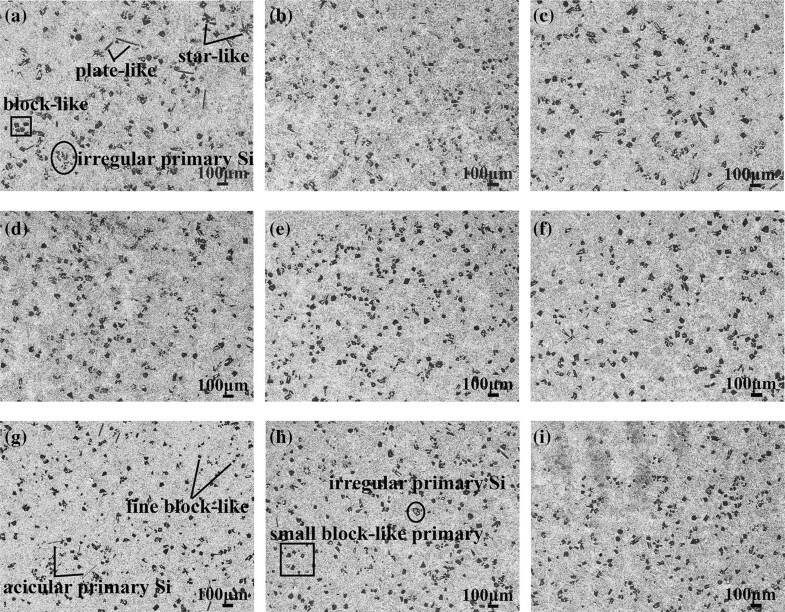 XRD patterns and microstructure with EDS results of various modifiers: (a) XRD images; (b) the SEM image of Al–5Ti–1B; (c) the BSE image of Al–20Y; (d) the BSE image of mixed modifiers. EPMA of mixed modifiers: (a) BSE image; (b) Al element; (c) Ti element; (d) B element; (e) Y element. Figure 4 shows the SEM micrographs and three-dimensional morphology of unmodified Al–20Si alloy. As shown in Figure 4a, the coarse block-like, plate-shaped and irregular primary Si is distributed on the Al matrix. In Figure 4b, the morphology of primary Si mainly exists in the form of the irregular polygonal shape with the large-angle groove in the growth front. The magnified image is marked with the black line in Figure 4b. Similarly, the morphology and distributed state of eutectic Si are shown in Figure 4c, and its three-dimensional structure is shown in Figure 4d. It is clearly observed that the unmodified eutectic Si is the coarse plate shape and acicular shape. 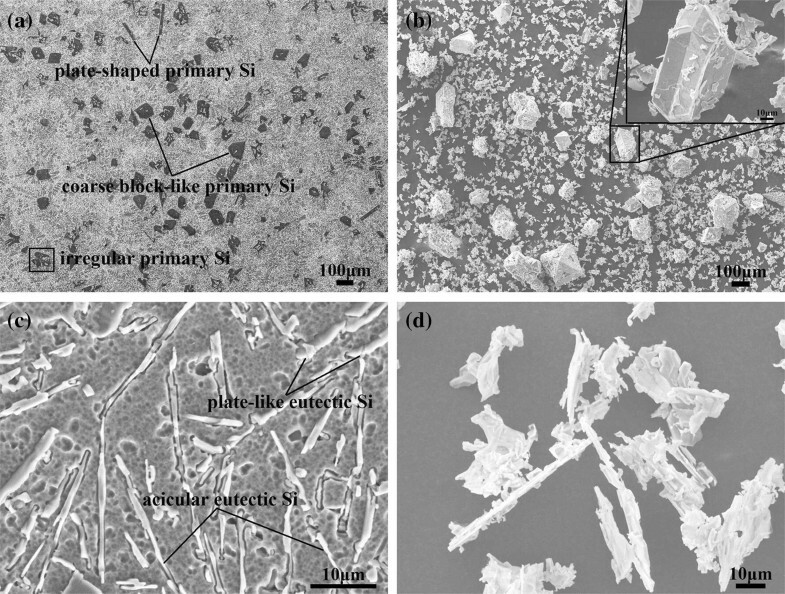 SEM images and corresponding three-dimensional morphology of unmodified hypereutectic Al–20Si alloy: (a), (b) primary Si; (c), (d) eutectic Si. Figures 5 and 6 reveal the morphology evolution of primary Si and eutectic Si in different Al–20Si alloys respectively. It is observed that the modification process can remarkably refine primary si and modify Si phases. In order to comprehensively assess the refinement and modification effect, the average grain size and aspect ratio of primary Si and average roundness of eutectic Si were measured, as shown in Figure 7. 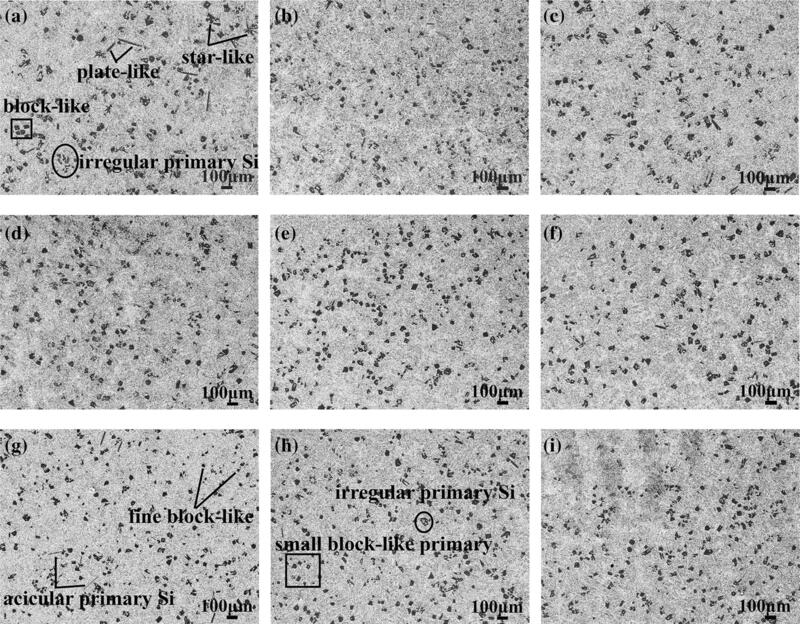 SEM images showing the effect of the modification process on primary Si in hypereutectic Al–20Si alloys: (a) A1; (b) A2; (c) A3; (d) B1; (e) B2; (f) B3; (g) C1; (h) C2; (i) C3. 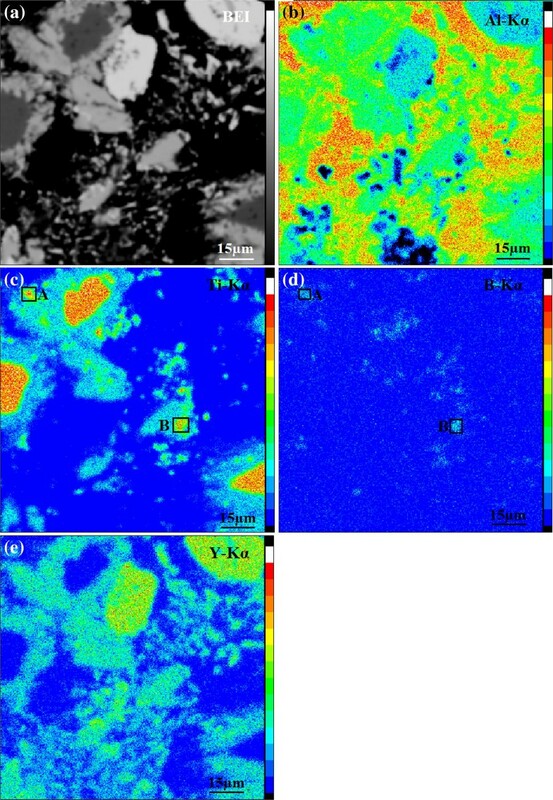 SEM images showing the effect of the modification process on eutectic Si in hypereutectic Al–20Si alloys: (a) A1; (b) A2; (c) A3; (d) B1; (e) B2; (f) B3; (g) C1; (h) C2; (i) C3. Average grain size, aspect ratio and roundness of primary Si and eutectic Si with different modification processes: (a) average grain size and aspect ratio of primary Si; (b) average roundness of eutectic Si. Figure 5a–c shows the SEM image of A1, A2 and A3 alloys. It can be seen that the morphology of primary Si changes from the coarse block-like/plate-like structures into fine and regular block-like structures. The A2 alloy has the best refinement effect among the A series alloys, with average grain size and aspect ratio reduced into 38 µm and 1.68, respectively. The B1, B2 and B3 alloys present similar evolution tendency with A series alloys in morphology and size, as shown in Figure 5d–f. Figure 5g–i shows the morphology evolution of C1, C2 and C3 alloys. The results demonstrate that the C2 alloy possesses the best refinement effect in all alloys. In Figure 5h, the regular and fine block-like primary Si phases are homogeneously distributed on the alloy matrix. From Figure 7a, it can be known that the mean grain size of primary Si is decreased from 82 to 29 µm and the average aspect ratio of primary Si is declined from 1.81 to 1.47. The results confirm that the modification process can not only effectively reduce the size of primary Si, but also change the morphology of primary Si crystals. The effect of the addition of yttrium and Al–5Ti–1B modifiers mixing melt on the morphology of eutectic Si is illustrated in Figure 6. The morphology of eutectic Si is modified into the short rod-like and partial granular structure, as shown in Figure 6a–c. It should be noted that the A1, A2 and A3 alloys indicate a good modification effect compared with the unmodified Al–20Si alloy. In Figure 6d–f, the morphology evolution of eutectic Si which is named as B1, B2 and B3 alloys presents the similar trend with the A series alloys. As shown in Figure 7b, the average roundness of B series alloys is lower than the A series alloys, which indicates that B1, B2 and B3 alloys have a better modification effect on eutectic Si. The C1, C2 and C3 alloys further demonstrate an ascendant modification effect on the morphology of eutectic Si, as displayed in Figure 6g–i. Compared with all modified alloys, the morphology and roundness of eutectic Si in C2 alloy show the optimal modification effect. According to Figures 6h and 7b, it can be obviously found that the morphology of eutectic Si transforms into partial particles and fine fibrous structure, with the average roundness of eutectic Si reduced from unmodified 7.8–2.32. The above results evidently indicate that the modification process can effectively modify eutectic Si in hypereutectic Al–20Si alloy. Figure 8 shows the three-dimensional morphology of primary Si and eutectic Si in C2 alloy. As shown in Figure 8a, the regular and fine block-shaped primary Si is in uniform distribution, and the primary Si exists with the edge-passivated polygons in the magnified image marked by black line. The melt temperature of Al–20Si alloy will drastically decrease when the low-temperature modifiers mixing melt was poured into the high-temperature Al–20Si melt, which can introduce the great undercooling, shorten the solid–liquid two-phase area and increase the nucleation efficiency of primary Si.33, 34, 35, 36 On the one hand, the initially precipitated crystal nucleus or cluster of primary Si will be fused in subsequent isothermal process, which can promote the grain multiplication of primary Si. On the other hand, as shown in Figure 9a, c, it can be clearly seen that the white particles marked with A are distributed around the primary Si and mainly contained the rare earth Y element. In other words, the rare earth Y with the great electronegativity will be pushed to the interface frontier of the primary Si to restrain the growth of primary Si.37 In addition, the rare earth Y will attach on the site of twin-plan re-entrant edge (TPRE) to change the growth orientation of primary Si from the <111> crystals orientation to <112> orientation in (111) planes, which makes the anisotropic growth of primary Si transformed into the isotropic growth.38 Therefore, the microstructure of primary Si refined into the uniform and fine block-shape in C2 alloy. 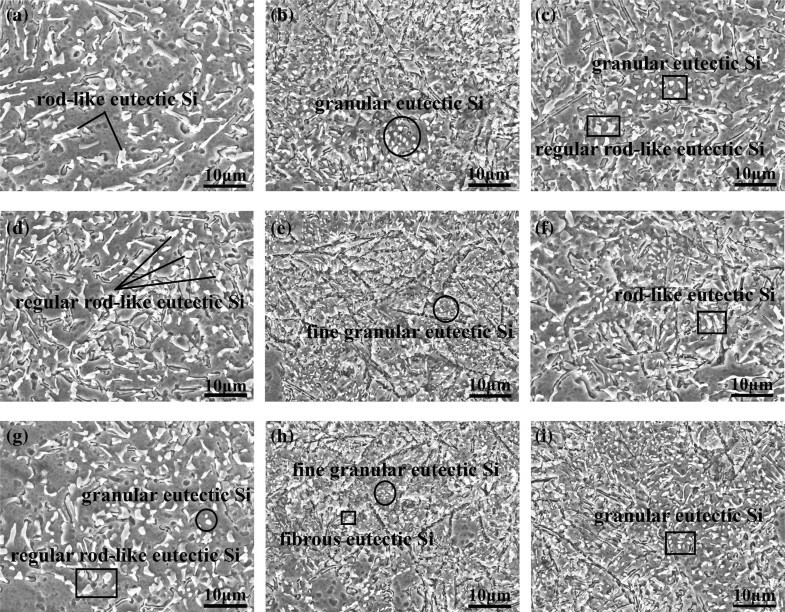 SEM images and corresponded three-dimensional morphology of the best modified hypereutectic Al–20Si alloys: (a) primary Si; (b) eutectic Si. EPMA of C2 alloy with modified by 3M process: (a) BSE image; (b) Al element; (c) Y element; (d) Si element; (e) Ti element; (f) B element. Meanwhile, the multi-branched coral fibrous eutectic Si phases are displayed in Figure 8b. In order to explore the modification mechanism of eutectic Si, EPMA was carried out to confirm the existence and distribution of modification elements, as shown in Figure 9. It can be distinctly seen in Figure 9a, c, the white particles marked in black A are Y-containing compounds. The intermetallic compounds are non-homogeneously distributed at the eutectic Si/Al interface. This is because rare earth Y has extremely limited solid solubility in Al and Si, which will be pushed to the front of the growth interface of Si phase during the solidification process. Similarly, the enriched rare earth atoms at the solidification surface increase the undercooling, which decreases the nucleation temperature and promotes the nucleation efficiency of Si phase.39 According to the impurity-induced twinning (IIT) theory,40 rare earth Y possesses the refinement and modification ability for Si phase in hypereutectic Al–20Si alloy because the atom–radius ratio of the modification element Y (0.18 nm) to the silicon (0.117 nm) is 1.538, which is close to the values 1.646. In addition, the intermetallic compounds containing Ti and Y elements are found in Figure 9c, e marked in black B. The rare earth atom can form compounds or clusters via being absorbed on other atom surface due to its great electronegativity.41 In order to clarify the detailed elements ingredient, the line scanning analysis of the B point in Figure 9e was drawn by EPMA, as exhibited in Figure 10. The results demonstrate that the (TiY) clusters are adsorbed at the interface of eutectic Si/Al to suppress the growth of Si phase.42 Therefore, the morphology of eutectic Si will transform into the fibrous structure after modification process. Furthermore, the trace amount of boron (B) was found in the same position, which may be attributed to that the local TiB2 particles acted as a nucleation substrate of eutectic α-Al. Distribution of element along the horizontal line at the point B in Figure 9(e). Figure 11 shows the morphology of α-Al dendrites of different modified alloys. The initial SEM picture of A2 alloy (Figure 11a) shows the binary process. Figure 11b shows the refinement effect of α-Al dendrites. 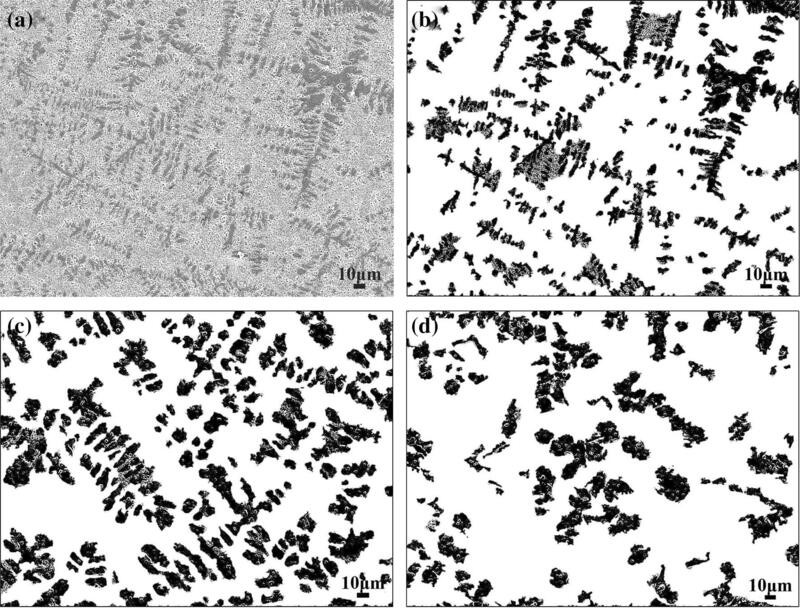 Similarly, the α-Al morphology of B2 and C2 alloys was obtained by the same procedure; the results are shown in Figure 11c, d. It can be found that the morphology of α-Al changes from the coarse dendrites into the uniform equiaxed shape. According to the solidification theory, the α-Al and eutectic Si simultaneously precipitate through the eutectic reaction. The Al atoms and Si atoms will diffuse to their respective solid–liquid (S–L) interface to ensure the growth of α-Al and eutectic Si during the solidification process. However, the advective solute atoms and atomic clusters will enrich in the S–L interface, which hinders the diffusion of Al atom and Si atom.43,44 As shown in Figure 12, the TiB2 particles act as the nucleation substrate of α-Al, which enhances the nucleation rate; the (TiY) clusters further restrict the growth of α-Al dendrites.45 At the same time, the rare earth Y atom and (TiY) clusters will attach on the growth front of eutectic Si to prevent it from further growing.46 Therefore, the predominant refinement effect of α-Al dendrites and eutectic Si can be achieved by the 3M modification process. Morphology and binarized images of α-Al dendrites in different hypereutectic Al–20Si alloys: (a) A2 alloy; (b) binarized image of A2 alloy; (c) binarized image of B2 alloy; (d) binarized image of C2 alloy. Schematic diagram of refinement and modification mechanism of α-Al and eutectic Si. Figure 13 shows the tensile fracture morphology of unmodified hypereutectic Al–20Si alloy. It can be found that the fracture surface is mainly covered by cleavage plane and partial torn edge, as shown in Figure 13a. As shown in Figure 13a, the magnified image of black rectangle represents the local fracture morphology. It can be obviously seen that the cracks easily initiate from the coarse and irregular primary Si crystal, as shown in Figure 13b. The result demonstrates that the fracture mode of unmodified Al–20Si alloy is classical brittle trans-granular fracture. In addition, the initial Al–20Si alloy possesses the relatively poor ultimate tensile strength (UTS) and elongation (EL), which are 94 MPa and 1.12%, respectively. Tensile fracture morphology of unmodified hypereutectic Al–20Si alloy: (a) fracture image; (b) the magnified image of the black rectangle in (a). Figure 14 is histogram of the UTS and EL of hypereutectic Al–20Si alloys modified by 3M process. It can be observed that both the UTS and EL distinctly improve in all modified alloys. For the C2 alloy with the best refinement effect, the UTS is enhanced from 94 to 154 MPa and the EL is increased from 1.12 to 1.79%. The unmodified primary Si and flake-like eutectic Si own the sharp edges, where stress concentration and cracks occur. Therefore, the mechanical properties of Al–20Si alloy distinctly improve when primary Si phases are refined into regular block and eutectic Si phases are modified into fibrous morphology, as shown in Figure 14. Ultimate tensile strength and elongation of hypereutectic Al–20Si alloys with modified by 3M process. 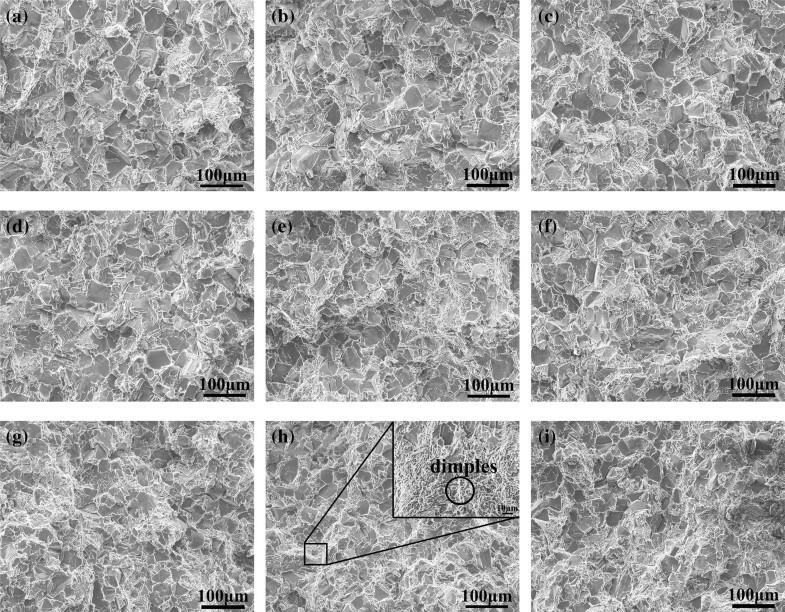 Figure 15 exhibits the tensile fracture morphology of modified Al–20Si alloy. The fracture surfaces are all covered by the cleavage stairs, which further confirms that the fracture feature of Al–20Si alloy is mainly the brittle fracture. However, the cleavage stairs become fine and uniform with the refinement and homogenization of modified alloys. Through comparing the A series alloys with C series alloys, it can be known that the number of torn edges in the fracture surface gradually increases with the different modification processes. In addition, the local dimples are observed around the torn edges, which demonstrate that the partial ductile fracture character exists in the best modified alloy, as shown in the magnified image of Figure 15h. Therefore, it can be concluded that the fracture mode of hypereutectic Al–20Si alloy transformed from the traditional brittle trans-granular fracture mode into the ductile–brittle mixed fracture style after modification. Tensile fracture morphology of different hypereutectic Al–20Si alloys: (a) A1; (b) A2; (c) A3; (d) B1; (e) B2; (f) B3; (g) C1; (h) C2; (i) C3. The modification process can remarkably refine the primary Si. The morphology changes from coarse irregular block-like/plate-shaped structures to fine block-like structures, with mean grain size decreased from 82 to 29 µm and the average aspect ratio reduced from 1.81 to 1.47, respectively. The 3M modification process can effectively modify eutectic Si structure from the coarse flake-like/needlelike structures to fine fibrous structures, with average roundness of eutectic Si decreased from 7.8 to 2.32. The coarse α-Al dendrites were refined into uniform equiaxed grains after modification. The mechanical properties of Al–20Si alloys can be significantly improved after modification of Si phases. The C2 alloy enjoyed the best modification effect, with ultimate tensile strength enhanced from 94 MPa to 154 MPa and the elongation increased from 1.12 to 1.79%, respectively. With the refinement and homogenization of microstructure, the fracture model gradually shifts from classic cleavage trans-granular fracture mode to the ductile–brittle mixed fracture style. The authors wish to acknowledge the financial supports of the National Natural Science Foundation of China (Grant Nos. 51561021, 51661021). Observation Historically both ‘modification’ and ‘refinement’ have been used to denote the changes in silicon structure in hypereutectic Al–Si alloys. This lack of clarity in terminology is particularly confusing in this paper, because both an yttrium addition and an Al–Ti–B grain refiner were employed. To make matters clear, the term ‘modification’ should be used to denote changes in the eutectic silicon; and the term ‘refinement’ should refer only to the reduction in size of the primary phase (silicon in hypereutectic, and aluminum in hypoeutectic alloys). Answer Special thanks for your good comment. I am very sorry for the confusion caused by my inappropriate description. As Geoffrey K Sigworth said, actually, the “refinement” and “modification” are two different concepts. The refinement mainly refers to the change of the size of the primary phase, for instance, the reduction in the size of primary Si in hypereutectic Al–Si alloy. However, the modification mainly indicates the change of eutectic Si in Al–Si alloy. Therefore, we have carefully examined and checked the description of both primary Si and eutectic Si. The final paper has been revised. We have correctly used the “refinement” to describe the reduction in size of the primary Si, and used the “modification” to state the change of the eutectic Si. Answer Special thanks to your good comment. In order to obviously demonstrate the change of α-Al dendrite, the corresponding SEM image of α-Al dendrite with high magnification (300 × ) is shown in Fig. 11a in the paper. However, the partially microstructural description lead to a misunderstanding about the refinement of eutectic α-Al phase. According to our experiments and research, the distribution of eutectic α-Al phase in Al-Si alloy with the high content of silicon has two different situations. On the one hand, the α-Al phase grows into the small ‘globules’, or sometimes as a ‘halo’ around primary Si, as shown by the red circle in Fig. 17a. On the other hand, the α-Al dendrite will be formed in the areas where primary silicon is sparse, as shown the red rectangle in Fig. 17a. The similar situation also appears in 390 alloy refined with 45 ppm P, the corresponding areas marked with the red circle and rectangle in Fig. 17b, respectively. According to the reports (Refs. [1, 43] in the paper), the addition of Ge and Ni–Si inoculation could improve the temperature of eutectic reaction and shorten two-phase coexistence area. Therefore, the nucleation temperature of α-Al and eutectic Si will be reduced. Similarly, the addition of rare earth yttrium also could increase the nucleation efficiency of α-Al and eutectic Si. 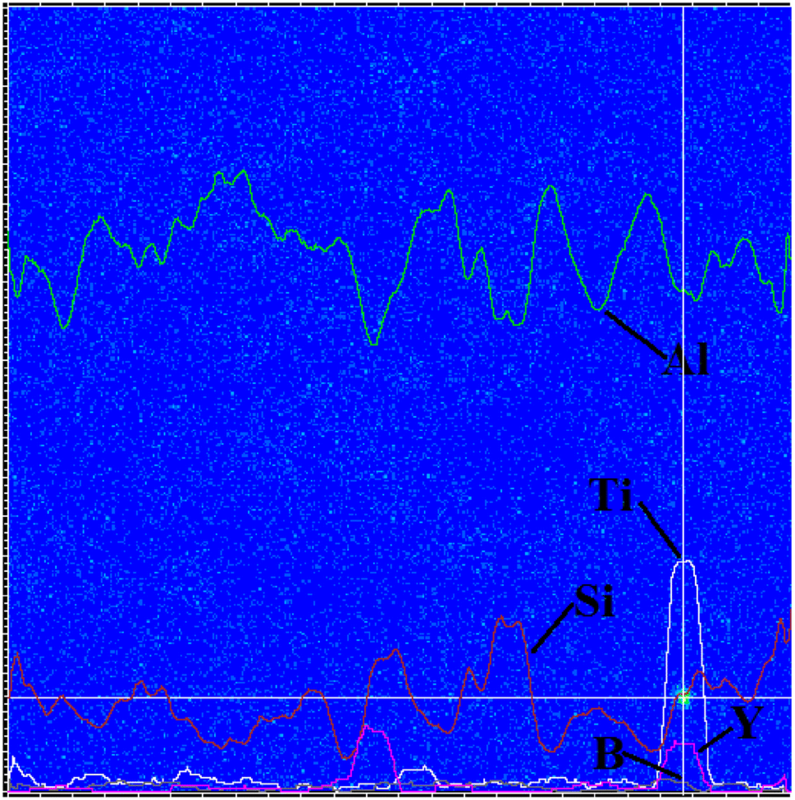 The α-Al phase that is formed around the primary Si always presents the small ‘globules’, or sometimes as a ‘halo’ around primary Si, which is mainly attributed to the α-Al phase normal growth attached to primary Si. Meanwhile, the primary Si can be refined because the rare earth atoms are absorbed in the groove of the twin crystal and inhibits the growth of primary Si. However, the eutectic α-Al phase that is formed in the areas where the primary Si is rare and uneven distribution will quickly grow and coarsen during the solidification process. 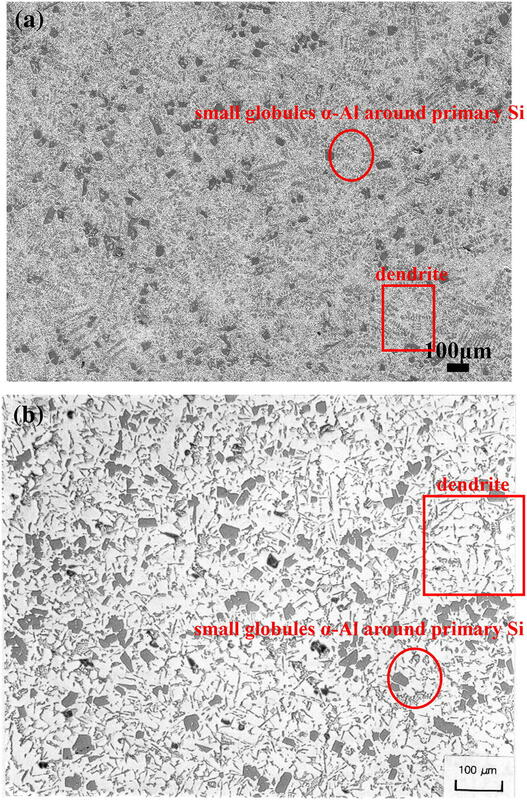 Therefore, we added the Al–5Ti–1B modifier into the Al–20Si alloy melt to change the morphology of α-Al dendrite. From Fig. 12 in the paper, it can be clearly seen that the TiB2 particles act as the nucleation substrate of α-Al to enhance the nucleation rate, and the (TiY) cluster further restricts the growth of α-Al dendrite. The specific results are shown in Fig. 11 in the paper. However, we have done no further study for the detailed formation mechanism of the α-Al phase with different situations in the paper. According to this review advice, we will conduct a detailed study on the formation process and mechanism of this phenomenon. Thank you again for your detailed and valuable comments, we will do more detailed research work based on your advice. Observation The Tibor addition employed in this study was one part in a hundred. The normal addition in hypoeutectic alloys is 1/10 to 1/5 of that. The yttrium additions were also quite large. Hence, the proposed process will be rather costly. It is not clear that improvements in cast structure will justify the additional cost. The refinement of primary silicon was modest—from 82 to 29 microns. In 390 alloy, a good refinement with phosphorus easily produces an average primary silicon size of 25 microns or less (Figs. 16b, 17b, 18). Through the above comparative analysis, it can be accepted that the effect of the addition of yttrium and Al–5Ti–1B modifiers mixing melt on microstructure evolution of Al–20Si alloy has some scientific research value. Furthermore, we will continue to improve the modification process to reduce costs and increase efficiency according to Dr. G. K. Sigworth’s great and valuable advice. Observation Tensile properties were measured in this study. But these alloys are used for wear resistance, and refinement of primary silicon is done to improve machinability. The latter is most important. In conventional (hypoeutectic) alloys, the cost of machining an engine block is often greater than the cost of the raw casting. Machining costs are greater in 390 and other hypereutectic alloys, since diamond cutting tools and special surface treatments are needed. Neither machinability nor wear resistance were studied, so it is not clear if the proposed process will have any commercial impact. Answer Special thanks to your good comment. The question raised by Dr. G. K. Sigworth also is exactly what we want to consider next. Although the Al–Si alloy has better wear resistance, the machinability of the alloy decreases with the increasing of Si content, which makes the subsequent machining cost as expensive. 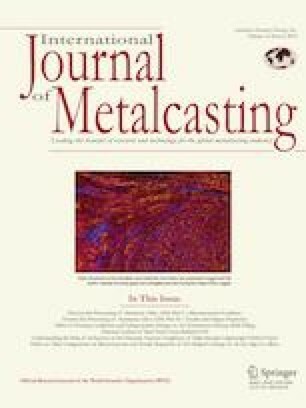 Therefore, more and more scholars paid their attention to research the multicomponent near-eutectic casting Al-Si piston alloy (Refs. [2, 32, 39] in the paper). The traditional alloying element is Cu, Ni and Mg in near-eutectic Al–Si alloy. In the present work, we firstly introduced the yttrium and Al–5Ti–1B modifiers mixing melt into the hypereutectic Al–20Si alloy to obtain the fine structure and enough ultimate tensile strength for manufacture of the engine block or piston. In our next work, we have studied the effect of yttrium addition on the microstructure and mechanical properties of multicomponent near-eutectic Al–Si–Cu–Ni–Mg piston alloy. According to Dr. G. K. Sigworth’s valuable advice, we will investigate the wear resistance and machinability of multicomponent Al-Si piston alloy. In summary, our purpose is to establish a relatively complete system to study the refinement and modification effect of rare earth elements in Al–Si piston alloy. Thank you again for your good and valuable comments, we will do more detailed research work based on your advice. We would like to express our sincere thanks to the Editor-in-Chief Thomas Prucha and Dr. Geoffrey K Sigworth for the constructive and positive comments.